I get asked about the value of real estate in areas to the north and east of Durham Region on a regular basis. Yes, the Durham market has been very strong in recent years, but how do adjacent districts compare, and which area will do well heading into the future? This article will look at the performance of MLS residential home sales in Durham Region, Kawartha Lakes (Lindsay), Peterborough and Northumberland (Cobourg, Port Hope). Statistics are from the Canadian Real Estate Association. Next, let's take a look at average price charts for each district with monthly stats since 2007. I will use figures from April of each year for comparison purposes. On each chart, that is the fourth bar to the right of the hash mark above January on the legend. The average residential resale home price in Durham was about 230,000 in 2007, and 515,000 in 2016. The average price here was about $220,000 in April, 2007 and $315,000 in April, 2016. In this district, the average price in April, 2007 was about $215,000, and in 2016 was about $305,000. For Northumberland, April of 2007 average was approximately $245,000, and in April 2016 was about $340,000. Looking at the charts, we can see that all areas showed increases, but the rate of increase is what sets things apart. 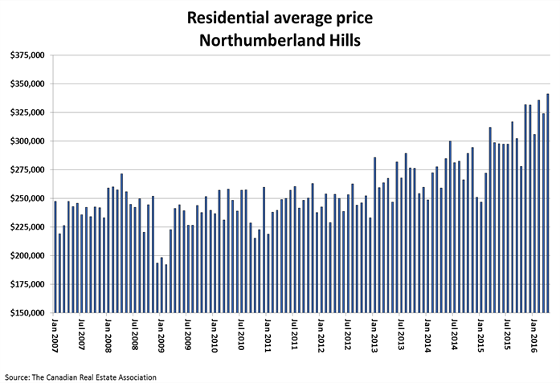 Note that in April 2007, the areas all had similar average prices, with Northumberland having the highest average price. In Durham, the average increased by $285,000, or 123.9%. Per year, that works out to 13.8% annually. 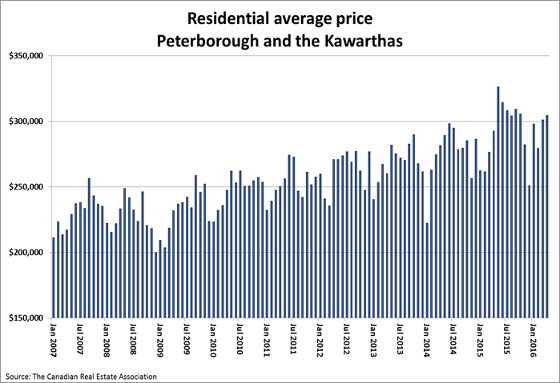 In the Kawartha Lakes district, the average gain was $90,000, or 43.2%. The average annual gain is just 4.8%. Similar results for both other districts - in Peterborough and the Kawarthas, the average increased $90,000 - 41.9% or 4.7% annually. In Northumberland, the average gained $95,000 or 38.8% - 4.3% annually. Proximity to Toronto - Durham Region is largely within commuting distance to the city. There are more people living in this area and working in the city than can manage the commute from further out. Local Jobs - Many of the manufacturing plants that used to be in outlying areas have either shut down or downsized. This has had impact in Durham as well, most notably in the automotive sector, but the other factors have helped to mitigate this impact here. Immigration to the GTA - Over 100,000 new immigrants come into the GTA each year. Most of these people are skilled and educated, and are seeking housing. While many may start out with a rental or purchase a condo apartment, these people are a driving force in the residential market. Take another look at the housing prices, and this additional demand makes Durham a high-demand alternative to the higher prices in the west and north GTA. According to Ontario's Ministry of Finance projections, the GTA will be the fastest growing region in the province, accounting for over 68% of the province's population growth (from 6.6 million in 2015 to 9.5 million in 2041). 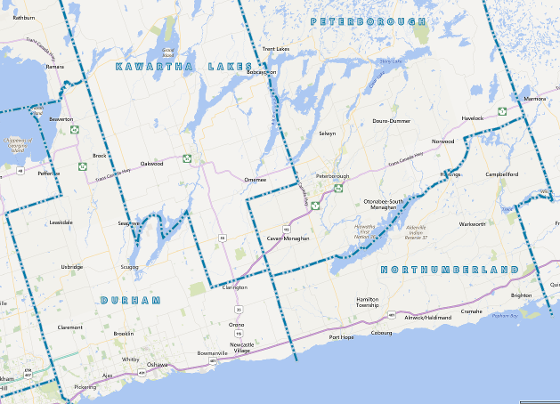 Population growth in Durham Region - According to Durham Region's planning department, the population in the region is currently around 666,000, and is expected to grow to 734,900 by 2020, with the largest increases happening in the municipalities in the south of the region, bordering on Lake Ontario. While no one can predict the future with absolute certainty, there are some things that will help define the performance of the markets in Durham and outlying areas in the coming years. These will all help increase commuting and traffic capacity both to Durham Region and also to outlying areas. This project will help increase demand for housing with an average of 8,000+ jobs annually until 2026. This element is going to affect housing universally. If the economy tanks, housing prices will follow suit. A major increase in interest rates will have an impact on housing affordability and demand. Reduced demand would drive prices lower. More changes like we have seen in the past relating to minimum down payments may influence local demand. Interestingly, it may actually spur demand in areas with lower average prices, as people looking to buy may be forced to look in areas where they can buy with the updated rules. As you can see, there are many compelling reasons to show that the real estate market will continue to show strength in Durham Region. 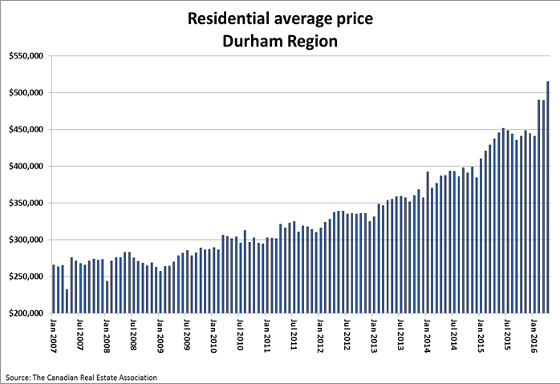 The strength of Durham's market may also have a spillover effect into the surrounding areas, as price differences drive demand in areas to the near north and east of Durham. Great article where do u see prices in Lindsay this year 2017? I have heard that they are on the rise ie a 2 bedroon 2 bathroom single family home is now around 400,000 where last fall they where 313,000. Hi Donna - prices are indeed on the rise in Lindsay. In March, the average home price was about 390,000. You may find that your example home is even more expensive as the spring market pans out. 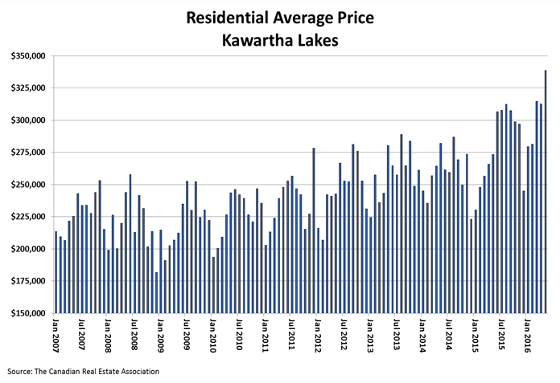 Expect the ripple effect to continue to impact prices in Kawartha Lakes. March prices in Oshawa, for example, rose 50.2% over 2016! As prices rise to the south, prices there will follow, albeit at a lower rate.